April 29th, 1945. The Liberation of Dachau. “On April 30, 1945, Jewish-American G.I. Richard Marowitz stormed into Hitler’s bedroom looking for anything he could bring back to headquarters. Richard Marowitz of Albany , NY was on the scene for the liberation of Dachau. The following day he was at Hitler’s villa in Munich. Here is his story as told to Matthew Rozell and a group of students at Hudson Falls High School ten years ago. Marowitz is a Jewish war veteran. Read the postscript to learn more about Hitler’s hat. –interviewed at Hudson Falls High School. On the 29th of April 1945, my platoon was called into the command post, we were in a little village, I don’t remember the name of it, but it was probably about 25-30 miles from Dachau. We were given new maps which showed Dachau, and we were told that the 20th Armored were already on the road to Dachau and our job was to take off and get to the tail end of the 20th Armored and be liaison between the 20th Armored and the infantry that would be coming down behind us in two and a half ton trucks, which is kind of idiotic but that’s the way the army was. The reason for that was we were having a race with the 3rd Division on one side of us, and the 45th Division on the other side of us, and they wanted the 42nd to win the race. So we took off on the road going very quickly like we usually do – if we came to a tree, the woods, or a village, we would stop and reconnoiter and find out if it was ok to go through without getting killed – and we kept getting pushed on the radio, ‘where are you,’ ‘what are your Greek coordinates,’ and ‘what’s taking so long? We are going to lose the race.’ After awhile of this kind of nonsense, Lieutenant Short stopped us and he said we to have to make a choice, either we’re going to have to step on the gas and go like hell and let surprise be on our side, or we’re going to lose the race and then everybody is going to get mad at us. So we decided to step on the gas and go like hell, which is what we did. In the process, we ran into a whole lot of little hornet’s nests – it would have made a movie you wouldn’t have believed anyways – for example, we cut a German convoy in half that was going across a road that we were on, firing as we went through they didn’t know what happened because we weren’t supposed to be there and they were driving off the road. We did the same thing with another convoy that was going on a road in the opposite direction and parallel to ours, and we just fired on them as we went. We came upon a village, and somebody fired on us and we went up on a small knoll next to the road and we dragged all the junk we had accumulated on the bottom of our jeeps like bazookas, mortars, etc. We fired on them and they probably thought they hit the front of the division. There’s no way they could’ve assumed it was only 28 men. Lieutenant Short stood up, honest to God, he actually said this: “Three men assault the town.” Three of us went in, Larry, myself and Howard Hughes, that’s his real name – great BAR man, Browning automatic rifle …and we claimed the first few houses, we accumulated 160, 170, 180 prisoners who looked around expecting to find more of us. We broke up their weapons, told them to put their hands on their heads and walk back up the road. They looked at us like were crazy; we looked back like we weren’t. We went through another village and a German fired a panzerfaust, which is like a German bazooka, it landed on the other side of us and blew us out of the jeep. We dispatched quickly and we got back in the jeep and took off again. These are the kinds of things that happened on the way to Dachau. When we got close to Dachau, you see there are a lot of smells in war, you smell the death smell all the time, but it’s usually farm animals who were rotting in the fields who were killed, rotting or whatever. As we got closer to Dachau, we got this awful smell and we assumed it was farm animals, that we were going to pass a farm, or whatever. We finally got to the outskirts of Dachau and were pinned down. Dachau was a favorite camp of the Germans, their first major camp, it was in Germany. They didn’t want to give it up the other camps were walkovers. The Germans just left them, and that was it. But in this case at Dachau, they didn’t want to give it up too easily, there were a lot of SS guys around. They were dropping some SS on us, and a lot of snipers – at one point an American tank came out of Dachau. We were stuck in the ditch at that point, we stood up and realized we made a mistake when the gun came down on us – but at that instant, an American tank destroyer came up behind us and blew the tank away. It happened to be an American tank that had been captured by the Germans and the guys in the tank destroyer knew that we didn’t have any tanks in there so therefore it had to be a captured tank. I kissed a tank destroyer that day. At that point, they told us to clean out the snipers and then proceeded to go into the camp. At the outskirts of that camp, we went into a house – we banged on it, it was like a little small farm on the outskirts. The door opened and there was a mother, a father, a daughter and a dog. The mother had buckteeth, the father had buckteeth, the daughter had buckteeth, and when I looked down and saw that the dog had buckteeth, I was just hysterical. It was the funniest sight, I was tense you know, and I could use anything at that point for a laugh. Of course the other guys looked at me like I was nuts! Anyway, we did find some snipers – one we did away with that was firing away from a house nearby. After we silenced him, we went up to see who it was. He was eleven or twelve years old, one of the Hitler youth, who were actually worse than the SS. They were just so brainwashed … we ran into a lot of those kids in their short pants. we found one man alive in that forty…there are some pictures of that one man, I don’t know whether he survived or not. The prisoners were just walking skeletons, and they just dropped where they were and died. There were piles of bodies, of bodies that had been gassed and readied for the ovens. Some of them still lived because those boxcars were brought to Dachau to burn those bodies. It was a total mess. And the smell was not a farm; it was Dachau that we had smelled miles before we got there. And yet, people in the village who were right next to the camps said they didn’t know what was going on. People in Munich, which was actually only nine miles from Dachau, didn’t know what was going on. Now if you want to believe that, the Brooklyn Bridge is still for sale. I never went back and I don’t intend to, I don’t feel like I want to. But it is almost impossible to describe the feelings, so I’m not going to try. But when you looked around some of these tough soldiers were throwing up and crying all over the place. It is not possible to really describe the number of feelings you get when you walk into something like that. Because that’s a scene that … well, first of all nobody told us about the camp! We had no idea what a concentration camp did. We were going to Dachau, period. It was another village as far as we were concerned. That’s kind of a shock to get all at one time. Interview recorded on May 3, 2002. See Rich and I in a 2014 NBC LEARN video here. 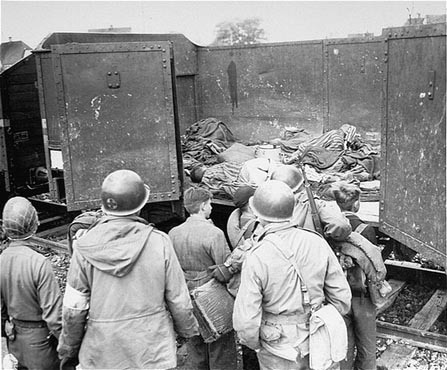 “On April 29, 1945, the 42nd Rainbow Division 222nd I&R platoon entered the gates of Dachau. One of many units sent to liberate the death camp, they saw first-hand the horrors of Hitler’s death machine. The next day, 12 men of the I&R were ordered to search Adolph Hitler’s Munich apartment for military intelligence. Jewish-American G.I. Richard Marowitz, self-appointed wiseacre of the unit, stormed into Hitler’s bedroom looking for anything he could bring back to headquarters. All he found was a black top hat. Still angered by what he had seen at Dachau, Marowitz flew into a rage and jumped on the hat, crushing it, imagining Hitler’s head still inside. Then Marowitz, known for his comic antics even under stress, put Hitler’s crushed hat on his head and marched through the apartment with his best imitation of Charlie Chaplin doing Hitler from The Great Dictator. Tense from the day before, the I&R unit cracked up. Years later Marowitz found out that the same day he stomped Hitler’s hat, the Führer committed suicide in his bunker. Marowitz returned home to Albany, N.Y., with the ultimate war souvenir stuffed into his duffel bag. He became a clothing manufacturer and professional magician and rarely talked about his war experiences. For the next 50 years, Hitler’s hat fittingly sat in a brown paper bag, buried at the bottom of his magic trick closet.